Nine years ago Pepper Holmes was living the retired life in Georgia, playing golf with her husband, Geoff. A boat ride, just a casual day trip with friends, changed that. Now the liveaboard couple’s retired lifestyle includes an annual voyage north to Chesapeake Bay to spend summers near their grown children and four grandchildren. Come fall they head south for the Florida Keys and the Gulf of Mexico to spend the winter in Southern comfort. They do it in a 1987 Grand Banks 42 Classic, a double-cabin, twin engine trawler yacht that’s one of the most successful designs ever, and one that helped put trawlers on the recreational boating map. The price was around $300,000. In the four years they’ve owned Rosetta, home-ported in Oxford, Md., the couple has come to appreciate her virtues as a boat as well as her character. There were compelling reasons why the 42 was “the right boat,” the couple says. First, Rosetta was in excellent shape, still under the care of her original owner. 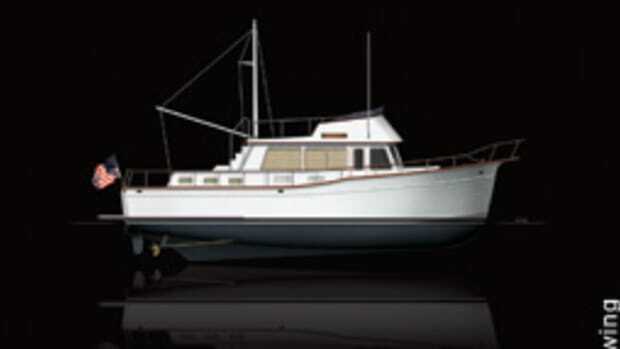 The 42 Classic’s twin cabin layout — with forward and aft staterooms — was a big attraction for the soon-to-be liveaboards. Privacy is important on a liveaboard boat that has frequent guests, and having cabins at opposite ends of the boat provides it. The roomy, versatile saloon with its galley up was another plus. “[The galley] is much more convenient because it’s closer to the dining area,” says Pepper Holmes. “And it’s more sociable, too.” Twin helm stations and twin engines were two other factors in the 42’s favor. The couple logs 3,000 miles each season and has run into varied conditions between Maryland and Florida. Rosetta’s handled it all. “She’s been dependable; she does very well [in a seaway],” says Holmes. 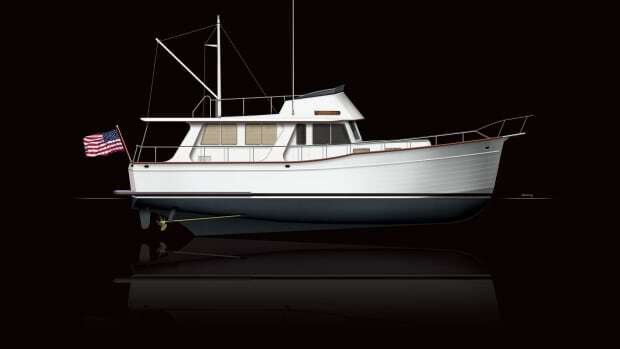 Borrowing from commercial fishing vessels, designer Ken Smith gave the Grand Banks 42 Classic a well-proportioned semidisplacement hull with a tall bow and sturdy bulwarks — trademarks that have changed little over the years. The teak-rich interior and parquet saloon sole also have become Grand Banks standards. There have been various floor plans over the years as the model was updated, but the twin-stateroom arrangement — one aft, one forward — remained the same. The forward cabin is down, laid out with a V-berth, hanging locker and private head compartment. Four ports and a hatch in the trunk-style cabin top provide light and ventilation. The distinctive aft cabin also is down, and came with either an island double berth or a pair of singles. There were two head arrangements depending on bunk choices, but both include a shower. 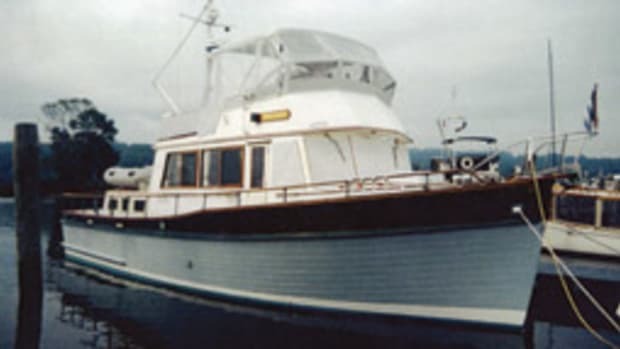 A companionway leads to the small aft deck, though this was eliminated in the post-1991 versions. The saloon is long and well-lit, and takes advantage of the boat’s 13-foot, 7-inch beam. The helm station is to starboard, next to a wing door giving direct access to the deck. The rectangular windows are tall and wide for good sightlines, and there’s a nav area for electronics and charts. The roomy, accessible engine room is below the saloon, reached through hatches in the sole. The galley is to port, with room for a sink, stove, oven and refrigerator. A second settee and an entertainment center were options, placed abaft the galley. An L-shaped settee and dining table abut the helm station. Thanks to its prolific production run, the Grand Banks 42 Classic is easy to find in the used-boat market. Equipment, amenities and hull material vary (wood models are still around), as one would expect, and prices run from the high five-figures to around $300,000 for preredesign models. A look through Soundings’ classifieds found the following: a 1988 model in Maryland in “pristine condition,” customized for long-distance cruising, listed at $295,000, including dinghy and outboard; a 1985 model in Wisconsin with twin Lehman diesels, new running gear and transmission, new electronics — including GPS and plotter — and kept in fresh water, for $278,000; and a 1976 model in New Jersey with twin 140-hp John Deere diesels, air conditioning, and twin heads (with a bathtub in the master head), listed at $148,000. That semidisplacement bottom helped establish the 42’s reputation for seaworthiness and performance, and was so successful it was used as the basis for Sport Cruiser, Motor-yacht and covered-deck Europa versions of the 42. Today, Grand Banks builds a fleet of yachts from 39 to 70 feet in three series: Eastbay (express), Heritage (trawler) and Aleutian (motoryacht). No longer in production, the last 42 Classic — hull No. 1554 — was launched earlier this year. 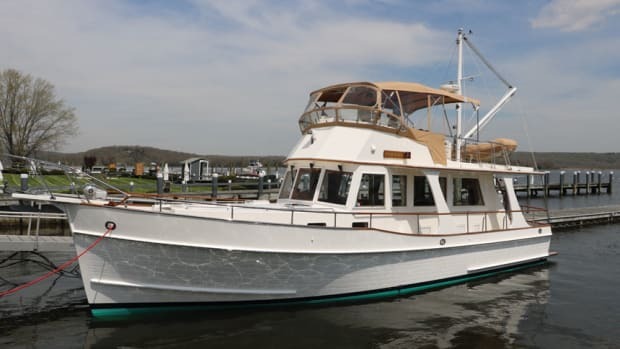 Designer Ken Smith’s Grand Banks 42 is an acknowledged classic, a salty trawler yacht with an aft cabin, sturdy wheelhouse and workboat-inspired profile that was built for nearly 40 years. The Europa version was an offspring.